What’s your opinion of the Mysterious Island? Achieving the maximum upgrade seems unattainable to me. Sorry I don’t have a post about that, I do have a post explaining the pirate ship trading though, which is here: https://thegirlwhogames.wordpress.com/2014/10/08/the-sims-freeplay-pirate-ship-trading/ but I am not really bothered about building that monument yet as I am still trying to find all the materials for my other monuments, sorry again! Created a new game. In the new update after lv. 5 I am not getting anymore blue cloud goals. HELP! Also no free dog?!?! I am play the red version for 14. Have you completed all the weekly goals and got a key? if so you cannot do anymore weekly goals until the next week. Do you have any info about the places on the island? Like, beach, carnival, arcade, pet park? I’ve built them all, but want to know what items to build within each one, what they do, etc. Hi! How much does it cost to own a premium house in the mystery island? hi! 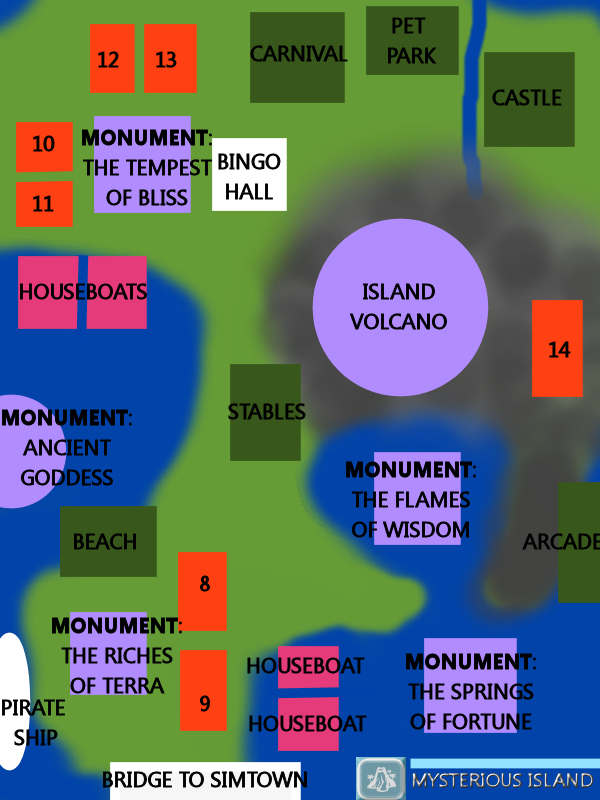 i am in the process of completing the monuments but im having a hard time finding the required materials.. like the wind for tempest of bliss and (molten) rock for flames of wisdom.. what activities would you suggest my sims do to get those materials? i have like 40 something of the non-rare materials and its frustrating.. what activities most likely generates wind, (molten) rock, gold bars? thanks!! will wait for your response..